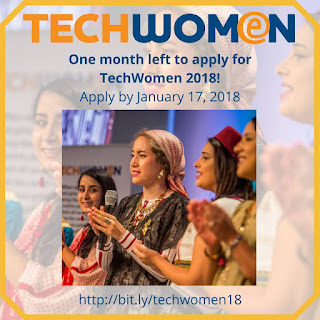 The 2018 TechWomen application is now open! Apply before 09:00AM PST (GMT-08:00), January 17, 2018. TechWomen participants are selected based on the eligibility requirements below. Applications are reviewed by independent selection committees composed of industry leaders and regional experts. Semifinalists may be interviewed by United States Embassy personnel in their country of permanent residence. The 2018 TechWomen application will launch mid-November 2017 and will remain open through January 17, 2018. Semifinalists will be contacted via email in/around March 2018. Final decisions will be made no later than early May 2018. All applicants will be notified of the results of their application.